XJ Lovers - Which XJ Do I Have? Since it was first unveiled in 1968, the XJ6 name has been carried by five models. The first three are differentiated only by slight styling or mechanical variations, sharing the same basic bodyshell and engine. While the fourth and fifth "XJ6's" do carry the nameplate, they incorporate major body, mechanical and electrical redesigns, share almost nothing with the earlier cars, and are rightly considered separate and distinct models. 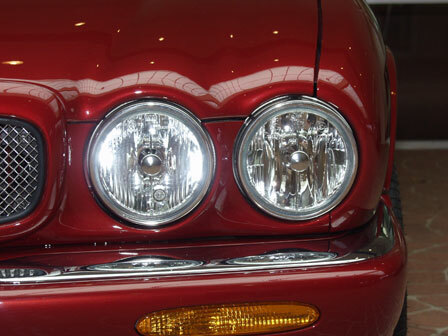 The terminology for the different versions of the XJ6 are: Series I (1968 to 73), Series II (1973 to 1979), Series III (1979 to 1986 in Europe and 1987 in the US), XJ40 (1987 or 1988 to 1994), and X300 (1995 to 1997). Unfortunately, the fact that all three basic types of cars carry the exact same external model name makes it a little difficult for the lay person to correctly determine which model or series they have. Adding to this difficulty is the fact that the X300 was deliberately styled to look like the Series III cars! There is a great deal of confusion possible here. Add in the XJ12 and later, the XJ8 models, and, well... Let's just say that even the cognoscenti can become confused. 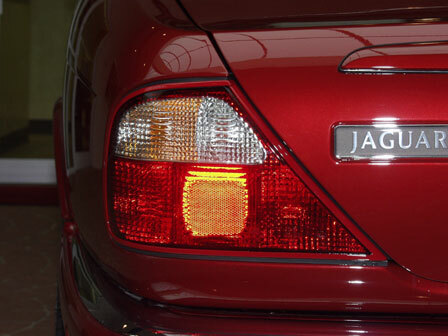 Often, someone with a car badged "XJ" will join the XJ list, only to find out that the participants know nothing about their car, because it is 'something called an X300?'. Or, someone with a 1987 XJ6 will join the Moderns list, thinking that that's where they belong, when they really have a late Series III and belong on the XJ list. While we here at Jag-Lovers don't really mind this sort of thing, it does tend to waste your valuable time. (Which could be spent polishing or working on your beloved Jaguar!) More importantly, it tends to confuse potential members, who get answers to their questions quickly, but unfortunately those answers bear absolutely no resemblance to what they see in their car. 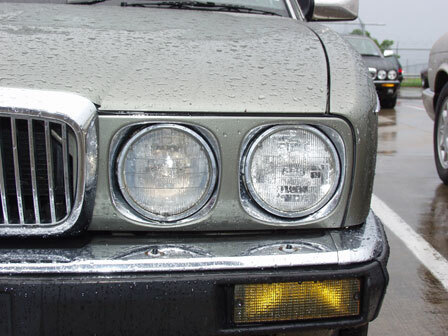 This guide has been created to assist in the proper identification of cars made after 1985. 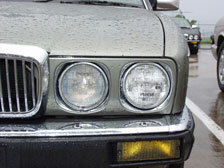 If your car was made in or prior to 1985, please refer to the dates above to determine which of the three series of the original XJ you have. If your car was made after 1985, please read on to determine which of these cars you have, and which of our resources here at Jag-Lovers will best suit your needs. Click on any picture to view a larger and more detailed version. Click on the text that describes your automobile to discover which version you have and where you can best get information and assistance about it on Jag-Lovers. Special thanks must be extended to Millennium Motorcars, the Jaguar dealer in Plano, Texas. They courteously made room in their beautiful indoor service drive for this photo shoot when the original location became unavailable due to weather, and graciously loaned us the 2001 X300 'XJR' to complete the set of three red Jaguars. Credits And Acknowledgements | Why are they called XJ/XJ40/X300? What's the difference? 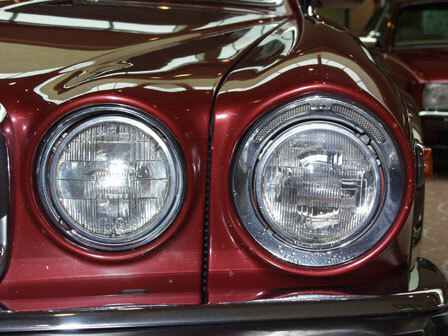 What do your car's headlights look like? 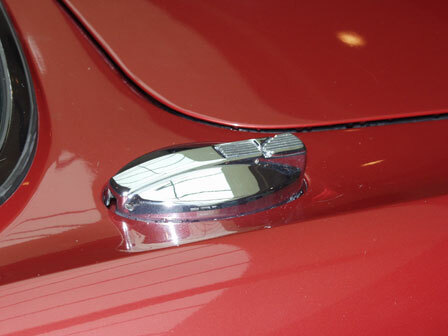 Two round lights on a side, with one in the fender (wing), and one in the hood (bonnet) such that it points down when open. 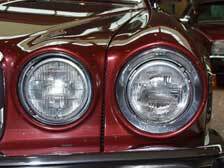 Two round lights on a side, but within a frame; with the inner headlight not moving when the hood is open. Two round lights on a side, but not within a frame; with the sheetmetal contouring over them. 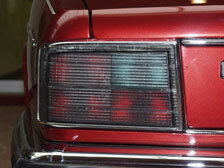 What do your car's taillights look like? What do your car's gas cap(s) or doors look like? Two chromed, exposed gas caps, with one on each side. Not removable. One gas cap, covered by a fuel filler door on the left side of the car. What does your car's dashboard look like? Aircraft-style, with four smaller gauges flanking two large ones. Integrated instrument pod. 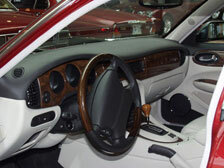 Tachometer, speedometer, and a combination fuel/coolant temperature gauge, recessed in individual cavities in the dash. 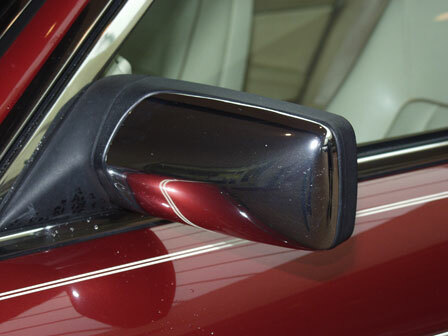 What does your car's rearview mirror(s) look like? Chromed metal, with rubber lip around the edge. High mount, with (usually) chrome inset panel in black body. Low mount. 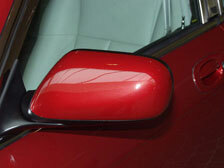 Black plastic with chrome or colored cover; contoured. What do your door handles look like? Ovoid, metal. 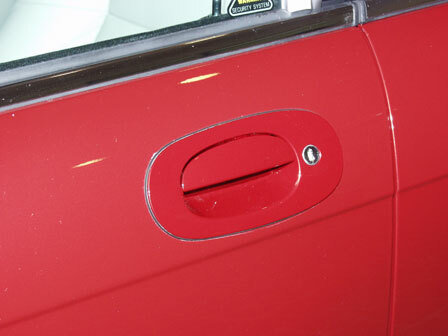 Lock mechanism mounted in door separately. Rectangular assembly; integrated lock. 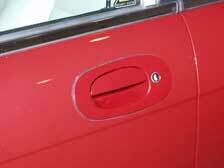 Round, contoured assembly; integrated lock. What does your car's engine bay look like? Obvious crossbraces connecting the fenders to the firewall. No crossbraces. Larry Karpman, our photographer and the owner of the beautiful 1987 XJ6 Series III Vanden Plas pictured here. David Nichols, who braved severe Texas thunderstorms to make sure we had a pristine example of the XJ40 on hand; specifically his wife Judy's 1991 XJ6 Vanden Plas, which is a two-time JCNA Concours champion (1999 and 2000). David Muir (and the rest of the staff) at Millennium Motorcars in Plano, Texas, who graciously arranged for us to use his dealership's handsome indoor service drive and lent us the X300 for this comparison, a 2001 XJR. 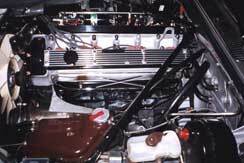 The picture of the XJ6 Series III engine bay is courtesy of John Testrake, and his JCNA Concours-winning car. Thanks to all of these people, and any others I may have forgotten. 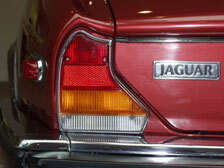 In 1968, Sir William Lyons, founder of Jaguar, unveiled his final sedan design to the world, the XJ6. 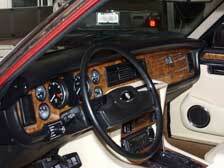 The Series I thru Series III XJ's are what many consider to be the definitive modern Jaguar sedans. 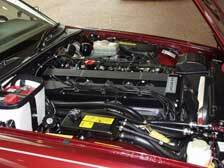 The engine most commonly found in these models was the twin overhead cam 4.2L inline 6 cylinder engine derived from the classic Jaguar XK racing motor. 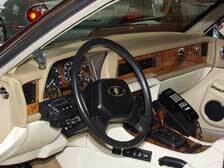 Other engines which were offered included the 2.8L and 3.4L inline 6 and the glorious 5.3L V12. 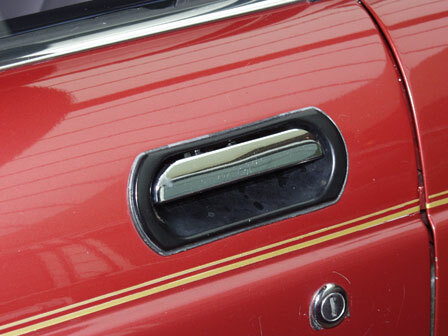 The Series I became the Series II in 1974, with a more "modern" grille being the chief external difference, and the later introduction of the coupe and long wheelbase models. In 1979, the design was revised with assistance from the Italian design bureau of Pininfarina, creating the Series III. In the US market, the Series III terminated with the XJ6 in 1987, but in other markets (notably Canada) the design soldiered on in the form of the XJ12 until the XJ40-based replacement arrived in 1993. 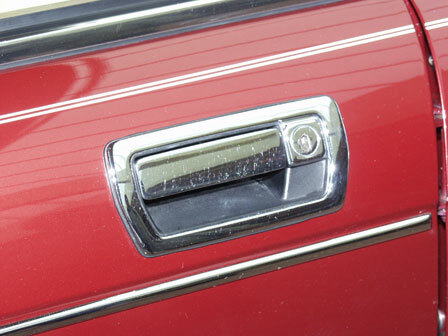 The Series III was originally intended as a stop-gap model; something to keep the wolves from the door while the replacement for the original (then 10-year-old design) was designed and built. 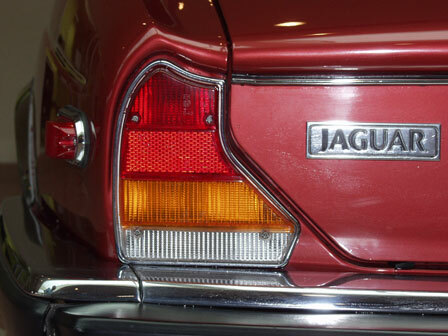 However, it ended up becoming the most numerous of the three series because the design, code-named "XJ40" and begun in the 70's, was repeatedly delayed. When the XJ40 (badged as an "XJ6" finally appeared after a (reportedly) 14 year gestation, it replaced the Series III slowly; introduced in Europe in 1986, it was produced alongside Series III cars for the US market until 1987, when the original XJ6 was killed off. By this time, Jaguar had more or less perfected the design of the XJ, and was well on the way to having a reputation as a builder of reliable, refined, and interesting luxury sporting sedans after the quality debacle from the late 70's under the British Leyland conglomerate until 1981-82 (just after Jaguar left the conglomerate). 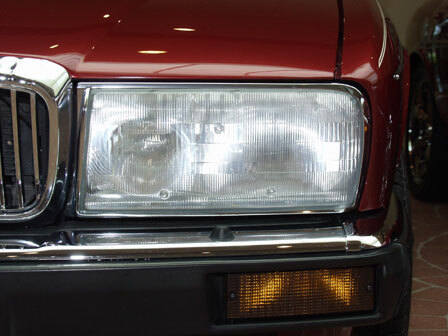 Due to some disturbing proposals by Jaguar's former parent corporation, British Leyland, the XJ40 was deliberately designed so as to be unable to have a V-configuration engine of any sort. 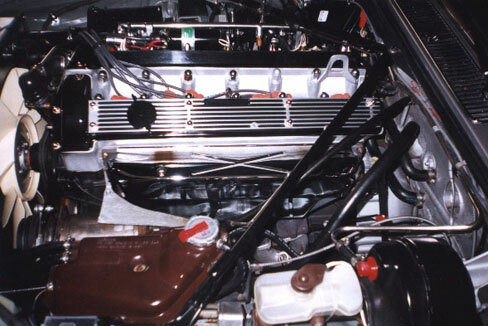 The engine bay was specifically designed for a slant six; in preventing the installation of the Rover V8 truck engine, the designers denied Jaguar a V12 variant of the XJ40. In order to not lose sales, Jaguar continued to build Series III XJ12's on almost a one-off basis until the redesigned XJ40 engine bay made it into production in 1993. 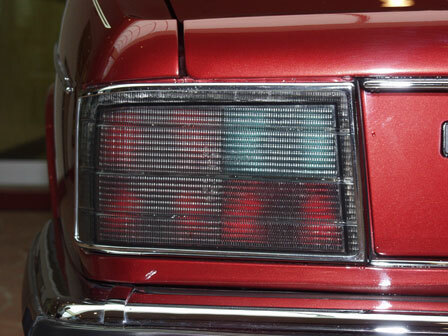 Since the United States did not receive any XJ12's during the Series III run due to government regulations, many Americans are unaware of the continuance of the line until 1992. Likewise, many other markets are unaware that the original XJ6 made it into 1987 before being killed off. 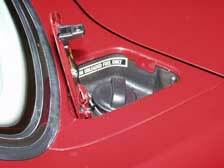 Of course, these staggered dates of production tend to confuse people when discussing their cars. 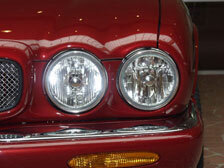 The XJ40 was a clean-sheet design, sharing almost nothing with it's predecessor. It was designed to look like a Jaguar, while being much easier and cheaper for the (then) struggling company to make. It was a roomy design, but there was much debate about the largely boxy look of the new sedan. Many thought that it wasn't as distinctive as a Jaguar sedan should be, while others liked it. The XJ40 was also powered by a new family of engines initially, the AJ6 and later the AJ16 slant-six engines, in displacements from 2.9L to 4.0L; the later, XJ12 versions received a revised 6.0L version of the mighty Jaguar 5.3L V12. 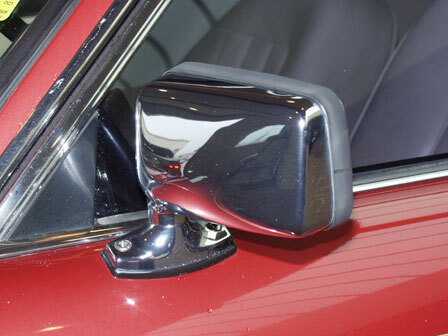 Unfortunately, the XJ40 suffered from quality control and design problems its first few years (86-90, especially) and did much to damage the reputation of Jaguar. Door handles breaking off, self-levelling suspension that didn't, computers that reported non-existent problems, and fragile interior trim put many people off. Eventually all these problems were corrected, but the damage was done. Jaguar fell on hard times and was bought out by Ford in 1990.